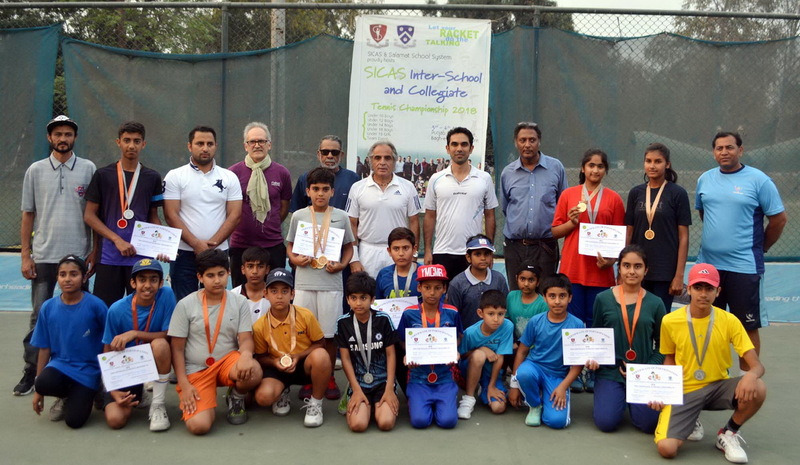 The final results of SICAS Inter School/Collegiate Tennis Tournament were held place on Friday. Bilal Asim of LGS 42-B won Triple Crown. The 11 and a half year old Bilal Asim won Under 18, Under 14 and Under 12 titles. Final of under 18 was a thriller between two spirited team of youngsters. Hamza Jawad from American Lyctef fought well against Bilal Asim of LGS but could not beat the champion and lost 6-3. In Girls Under 18 Nida Akam beat Zahra Suleman by 6-2. In Boys Under 14 final Bilal Asim again played very well and beat Hassan Ali 6-1 and won his 2nd title. In Under 14 Girls Zahra Suleman beat Aqsa Akram by 6-4 and won the title. In Under 12 Boys/Girls Bilal Asim beat Shaeel Tahir 6-1. In Under 10 Boys/Girls event Ehtesham Humayun beat Hamza Ali Rizwan by 6-4. In Mini tennis SICAS kids won the event.